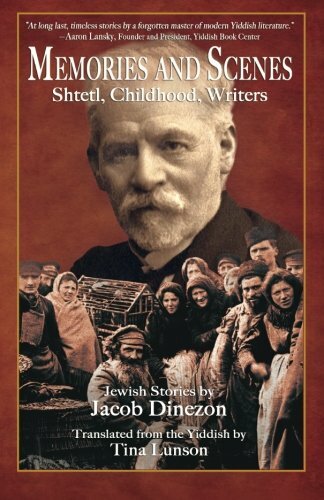 Jacob Dinezon (1856–1919) was a Yiddish novelist and short story writer, as famous during his lifetime as were his contemporaries, the three pillars of late 19th and early 20th century Yiddish literature, Mendele Mocher Sforim, I. L. Peretz, and Sholom Aleichem. All of these masters knew and were impressed with Dinezon’s work. During his period of literary activity in the latter half of the 19th century, Dinezon at times even outshadowed the three founding fathers because his books touched thousands of readers were more widely sold. In fact, one of his novels sold more than 200,000 copies, an unheard of success in Yiddish literature. Dinezon achieved fame at the age of 20 with the publication of his first novel, The Dark Young Man, and remained famous until the day he died. He was so well known and beloved that every major figure of Yiddish literature came to his funeral in 1919. Even encylopedias in English recognized him. The early 20th century Jewish Encyclopedia lists Dinezon as an important Yiddish writer (like Mendele and Peretz, and other classical Yiddish writers, Dinezon also established a reputation as a Hebrew author), praise that is echoed in the contemporary Encylopedia Judaica. Sometimes mazel plays a role in literary fame. But in Dinezon’s case it seemed to express itself in income and not in posthumous regard. And now that the worldwide Yiddish-reading community is vanishing, a writer’s lot can be determined by translation. If a writer doesn’t find his translator/editor in another language, he suffers the misfortune of neglect, which is what happened with Dinezon. If you ask any knowledgeable reader familiar with Sholom Aleichem and other famous Yiddish writers if he has ever heard of Jacob Dinezon the answer would probably be No. Until now not one work by Dinezon has appeared in English. But this lacuna has been successfully filled with the wonderful book of 11 Dinezon stories, beautifully translated by Tina Lunson and edited by Scott Davis, who has also provided an illuminating introduction. Dinezon was a social realist, accurately depicting small town (shtetl) Jewish life. With a cinematic eye he zeroes in on his characters, deftly telling fascinating stories while at the same time giving an accurate portrait of the mores, attitudes, speech and foibles of the men, women and children whom he depicts. Like Dickens, Jacob Denizon wrote about the downtrodden and about poorly treated students in Hebrew schools with such realism that he actually brought about reforms. A cross section of Jewish society in Poland lives in his pages: the young and old, Hasidim and enlightened Jews, simple workingmen and rich householders. Every single one of his stories breathes with life and verisimilitude. In this book of 11 stories, a collection published after Dinezon’s death in 1919, we have finely crafted tales—so in keeping with Jewish short story writing at the turn of the 20th century—that recall vividly portrayed shtetl characters from Dinezon’s childhood years and also portraits of such literary figures as Mendele Mocher Sforim (Sholem Abramovitsh), I. L. Peretz, and the playwright, Avrom Goldfaden, known as the Father of Yiddish Theater. Jacob Dinezon also played an important historical role in the development of Yiddish as a literary language. In fact, he mentored, advised, and befriended almost every major Jewish writer of his day. The list reads like a who’s who of late 19th and early 20th century modern Yiddish literature: Mendele Mocher Sforim, Sholem Aleichem, I. L. Peretz (whose first book of stories Dinezon published), Abraham Goldfaden, Sh. Ans-ki (author of the famous play, The Dybbuk), David Frishman, Shimon Frug, Sholem Asch, David Pinski, and Avraham Reisen. In one of the superb stories, “Mayer Yeke,” we see how a boy’s great fear of the shtetl’s most righteous Jew, Mayer Yeke, turns to love and respect after he witnesses Mayer’s mitzva assisting the town drunk. “Sholem Yoyne Flask” depicts a mild-mannered tailor transformed by the liquor in his flask into a fiery defender of the town’s poor folk. Then something happens when a surprising discovery is made about his flask. With “Motl Farber, Purimshpieler,” we are introduced to a housepainter who languishes during the winter when he cannot work, but at Purim time he becomes the leader of a band of Purim players. When the troupe is arrested by the new Russian police chief, an unlikely “Esther” comes to their rescue. A story that achieves the psychological depth of a Dostoevsky tale is “Yosl Algebrenik and his Student.” It tells the story of Yosl, an outstanding Talmud scholar destined to become a great rabbi, who has a singular passion for mathematics. But at age 30, for reasons no one remembers, he tosses away the Talmud and its commentaries for the study of algebra and algebraic logic. Some of Dinezon’s autobiographical sketches are as engaging as his fiction. In “My First Work” Dinezon relates the childhood experience of reading his first Yiddish novel, a Jewish version of Robinson Crusoe. He is so taken by the book, he writes his own adventure story. In “Sholem Yankev Abramovitsh” Dinezon tells how his debut novel, The Dark Young Man, was published and how he acquired his first copy in Moscow. It is not often that we are privileged to make a literary discovery of our own. With this book by Jacob Dinezon, the first in English, we happily encounter a master writer who deserves to be ranked with the great Yiddish writers whom he befriended and who admired him.